Don't be too cool for school and eschew wearing ear plugs when riding or racing your dirt bike or ATV. 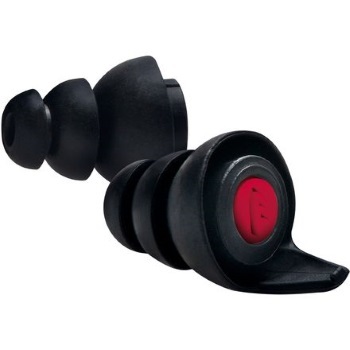 A number of ear plugs and styles of hearing protection exist. Like with all layers of safety you want what fits well and feels comfortable. However, keep in mind you wear a helmet that slips down over your ears. You may find some ear plugs don't dance well with your helmet. Additionally, in the event of a crash, wearing a plug that sticks out too much might result in a punctured ear drum if you land on the side of your head. When shopping for ear plugs you will notice a number followed by NRR which stands for Noise Reduction Rating. This rating tells you how many decibels the plugs reduce a given noise. Ear plugs with 24 NRR reduce noise by 24 decibels and plugs showing 33 NRR reduce noise by 33 decibels and so on. Depending on brand and style the decibel reduction rating generally ranges between the low 20s and low 30s. A dirt bike or ATV engine hovers from the low 80s to as high as 100 and you can reduce or raise that noise level with exhaust modifications. The National Institute on Deafness and Other Communication Disorders lists a regular street motorcycle at 95 decibels and the Centers for Disease Control states damage to hearing can occur after about 50 minutes of exposure to 95 decibels. Obviously, the higher the decibels the less amount of time you can "listen" without suffering hearing damage. Therefore, anticipate hearing loss after years of riding dirt bikes or quads without using ear plugs. 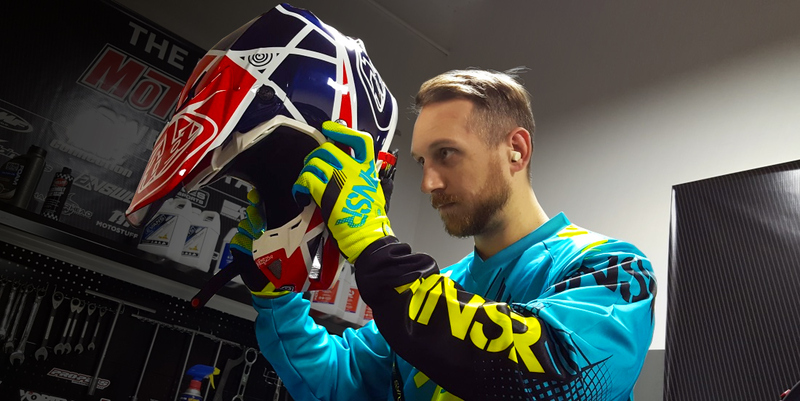 Some ear plugs have a string attached which you can always cut off, however these plugs tend to stick out quite a bit and may interfere with putting your helmet on. Other similar style plugs come without the string but still stick out thus risk getting pushed inside your ear canal too far in the event of a crash that lands you on the side of your head. Additionally, you may find the jostling of your helmet against the plug while riding distracting and annoying. The constant movement might dislodge the plug anyway rendering it useless. The popular and disposable foam inserts that you roll into a stick and allow to expand inside your ear canal don't protrude out as far and tend not to push inside any further after swelling inside the ear. If you have ever worn them you know any adjustments require removal first as these plugs do not re-adapt once inside the ear. Foam ear plugs have a greater tendency to come loose than other plugs so you have to fiddle with them a bit to get the right fit inside your ear. 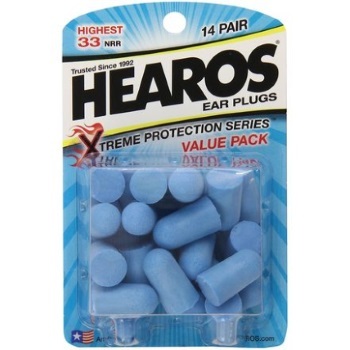 A wide range of the foam inserts exist with Hearos the most popular. MotoSport sells four different versions of the Hearos brand ranging from 27 to 33 NRR or try the Oxford brand of foam ear plugs offering NRR rating between 35 to 39. The Pinlock Ear Plugs look much like those we recommend avoiding and though common among motorcycle riders these plugs do not stick out anywhere near the ones noted above. In fact, they more or less sit flush with your ear and do not get in the way of your helmet. These plugs only reduce decibel levels by 24 so if you want better protection the foam inserts usually offer a higher level of protection. 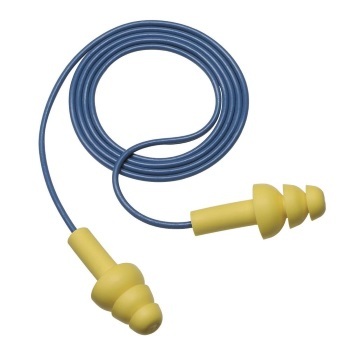 A third type of ear plug common with swimmers molds over the ear like a cover rather than insert into the ear canal and has virtually no chance of puncturing the ear drum in the event of a crash. This style takes a bit of getting used to and more time to knead and mold onto your ear. Mack's makes the most popular style of silicone ear plugs and offers a 22 NRR rating, the lowest of the more popular and widely available hearing protection. Regardless of what type of ear plug you use, many riders report better concentration while using ear plugs and even more importantly when it comes to racing drowning the outside noise lets you focus on proper breathing.